Artwork Panel: 44.2cm x 68.5cm ≈ 17½" x 27"
Silk/Brocade: 53.4cm x 128cm ≈ 21" x 50¼"
This character is "fo" in Chinese or "hotoke" in Japanese. 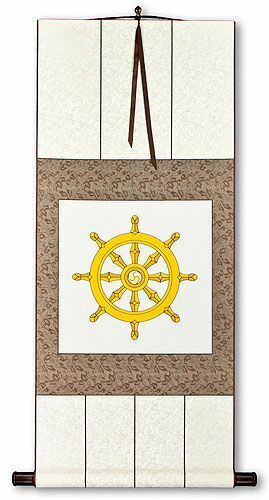 It means Buddha, or can simply refer to the Buddhist religion. This scroll did not pass my inspection. It has an almost invisible flaw in the silk. I am really picky about quality, so I can't sell this at full price - so instead I am taking a big loss and let it go for $39 (less than half price). Note: The ink on this one might be a little bit light for some people, but that is not considered a flaw in Chinese culture. 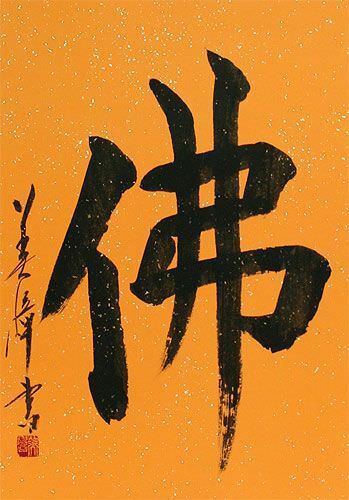 This calligraphy was done by Bishou Imai of Nara, Japan.